Not much happening. Took a pretty straight route from Natchez (south western Mississippi – by now y’all must have your atlas out to follow my trip 🙂 ) through Louisiana to Zwolle, near the Texas border. Drove thru some very small towns, you blink once or twice and that’s it. Not much to see and seemingly not much to do either. Saw a sign for lawnmower racing. You only come up with that kind of stuff when there is nothing else to do. I would have loved to see a race. One town worth mentioning is Natchitoches (pronounced NAK-ə-təsh), home of Northwestern State University and one of the oldest settlements in Louisiana. It was one of those surprises that popped up in front of me. Nice cobblestone streets and beautifully kept old buildings. The main street runs along the Cane River and not like so many other towns this main street is only two lanes and very quaint. OK, the town had a little touristy feel, but not too bad. The movie Steel Magnolia was filmed here as well. There is even a mini walk of fame with the actresses from the movie. A little lunch and off I went again. I feel as if I have neglected Mississippi a little bit. I just had this urge to move west. I didn’t even want to move north into Arkansas, a state I have never been to. From Tupelo I drove a bit south on the Natchez Trace Parkway, basically through the woods, up and down, not my favorite kind of road, too much work for my right foot. JD does fairly poorly going up hill. I left the parkway; it felt too sterile, manicured forest. Once I traded this two lane road for another things changed. Out of the woods into agriculture. 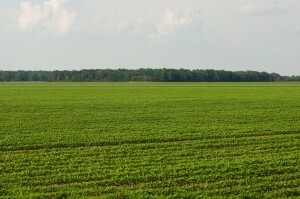 Everything is green, corn is in different stages of growth, some will be ready for July others a month later or so, soybeans, and of course there is cotton. I really regret that I won’t be in this area in September (of course I don’t know that for sure yet) when the cotton is in full bloom and ready to be harvested. Just thing of a beautiful snowy winter landscape minus the freezing temperatures. It must look great having all these cotton balls covering acres and acres of land. Pretty soon the rolling hills left me and it was easy gliding on a flat road, hurrah. This was Memorial Day weekend and I was very concerned about getting a camping spot. Several campgrounds I had talked to were full, booked months in advance. So I did what I don’t like to do, I made reservations; which means I HAVE to be at a specific place and a specific time, not my kind of traveling fun. I made a couple of phone calls and was told (by the general reservation’s line) that there are a couple of spots available, but it would be best to make reservations, so I did. A state park right at the Mississippi River, The Great River Road State Park in Rosedale, just across from Arkansas. 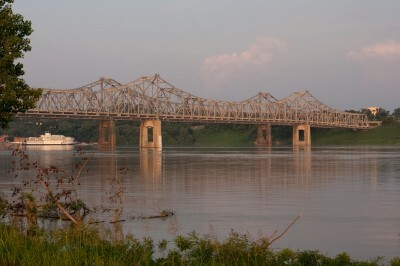 However, no bridge to cross into Arkansas. At least not in Rosedale. There is a bridge 40 minutes south or 1 ½ hours north. Anyway, I arrived late afternoon, after buying some essentials, e.g. ice cream, just to find the main office closed and not a soul around. We are not talking little park here, no this thing is big, about one mile from the main road. There are picnic tables and a lookout tower. The main office is high up on stilts, the might Mississippi overflows from time to time. OK, let’s drive to the camping area. Shi…, this place looks like a ghost town. Not a single camper around! Yeah, there was an old trailer, but no car or person near by. Fallen down trees and branches, the bathhouse, also on stilts, looked unused. Here I am in the middle of the woods and nobody around and the nearest campground an hour away. No cell phone reception. Let’s see if I can get any connection via the internet with Verizon and skype. The signal is super weak. I call the forestry department the only number I could find. The woman who answers the phone can barely understand me, connects me to a guy who tells me, “yes, the park is open”, we lose the connection, I call back, all I hear the woman say is “I can’t hear you”. Finally, it’s the guy again. He had gotten hold of the assistant manager for the park, she will come to the camp site, at least something. Wow, you have to picture this; campground with 61 sites and none of them look like they have been used in a very long time. It was creepy and I didn’t know if I wanted to stay there all by myself. Dorothy, the assistant manager, was very nice. Said if I didn’t want to stay I could get my money refunded. She told me that the park was flooded a year or two ago and never quite recovered from that. It also didn’t help that the last manager discouraged people from coming. Fortunately, the phone rang and people asked for availability for the night, great I won’t be alone. 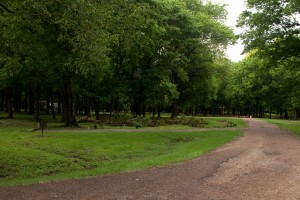 Once the initial “shock” had past and I had slept (2 groups of campers had shown up) I looked around and the park was quite beautiful, very quiet, tons of trees, birds and squirrels. The only drawbacks, mosquitoes and horse flies. So many that I had to put on long pants and a long sleeved t-shirt when I had to do anything outside and still, I got bitten in places where the sun don’t shine… besides the bucks, I also had no way to communicate with anyone, no cell, no internet. Some of you find this a blessing, but not in this case. I ended up staying all three nights as planned. I was only by myself for one of the three nights. 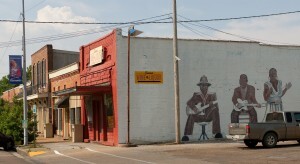 The next morning I drove up to Clarksdale, home of the blues. Seemed like a nice place. There were tourists checking out some of the stores. Other than that the place seemed empty. Clarksdale, like so many other small towns has great old building stock. Unfortunately, there is not enough money to keep everything in tact. In addition to crumbling facades, there are empty store fronts. Bill Lucket - future Mississippi governor? I was walking around taking pictures when I ran into a man on a ladder who was scraping off paint from one of those old buildings. He asks me what I am taking photos of and we got into a conversation first about stripping paint, restoring buildings and then politics (he is a Democrat). Turns out that he is the co-founder of “Ground Zero” (named before 9/11) THE blues club in town, the other founder is actor Morgan Freeman. Bill is in the middle of restoring this old four story hotel. Lucky me, once again, I got a glimpse of the inside. It must have been one of those grand hotels back in the 50s or 60s with ballrooms and mezzanines. Bill has his hands full with this one. 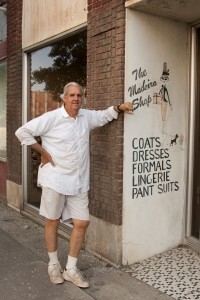 Restoring buildings is just a side business, Bill is a lawyer and he is running for Mississippi governor in 2011. Keep your eyes out for Bill Lucket. On my way home I drove through Dublin and Rome, not enough time to visit Brazil as well. That night I had dinner at the Blue Levee Restaurant just outside the campground at the site of an old gas station. From the outside the place looked like a regular small town dive. 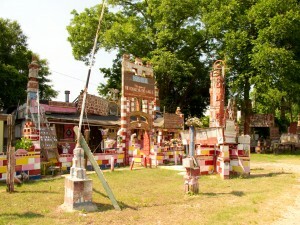 Dorothy had mentioned it to me the night before and it was also mentioned to me when I was in Clarksdale, one hour north from Rosedale. The place was packed. I counted about 60 guests. I didn’t have reservations, strongly recommended, so I sat at the bar. The countertop was a good 30 inches wide and about eight feet long, completely covered with beer caps (under plexi glass). I counted roughly 7,000 caps, the wait for the food was a little long, but worth the wait. They have 60 different beers on their menu! I heard something I hadn’t heard for some time, balsamic vinaigrette and Mediterranean salad. Remember, this is still fried food country. I skipped the special of the day, grilled Atlantic salmon, and I dared to be adventures and try something I never had before. Appetizer: fried green tomatoes, main course: blackened catfish with garlic mashed potatoes. The tomatoes were absolutely fine, but not something I would go crazy over. Another southern specialty I am not wild about. The catfish was yummy. I would have come back the next day for lunch, but they were closed. The nice thing about sitting at the counter is that you get to talk to the wait staff more than when you sit at a table. Everybody was crazy busy, but very nice. Rosedale is a town of about 2,000 and you would have not expected a restaurant of this caliber in this area. Don’t judge a book by its cover. Good luck in the future! The drive down to Natchez was straight forward, except when I decided to take a little county road and ended up going back north instead of south. That little detour cost me about an hour and a half and I wish I had that extra time towards the end of the day when I drove thru Vicksburg and Port Gibson. Two towns with beautiful old buildings worthwhile a closer look. Unfortunately, I was still one and a half hours away from my final destination and it was getting too late in the day and I couldn’t look around. However, I did stop at “Margaret’s Grocery”, actually the only reason I headed that way to begin with. You will notice that I drive to or thru towns for the strangest reasons. Sadly to say, Margaret’s Grocery was closed down. 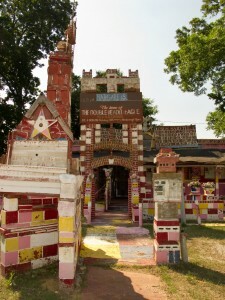 The once colorful structure was in bad shape, paint peeling and signs falling. 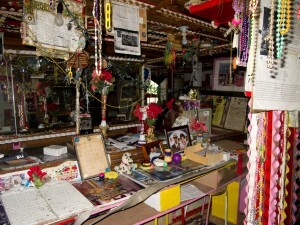 Reverend Dennis built this shrine out of love to his wife back in the 1980s. Margaret had the grocery store and Rev. Dennis made it into this colorful place of God. He used to preach in the school bus next to the store. You can read all about it when you google him and the store. Margaret past away last fall and the Reverend is in his late 90s, there was no sign of him. A kind hand opened the store to me and I was able to snap some inside shots. There was no light and I could only point and shoot and hope for the best. A local church is suppose to take care of the building, but I am not sure if that is going to happen, too bad. 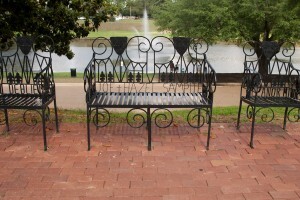 Natchez has a ton of antebellum homes and the historic downtown is well preserved. Finding a place that serves lunch after 2 PM is not so easy. That’s all I have on Mississippi. Comments are always appreciated. The report about Gadsden is in the works. Jicky! THis is fantastic! I am very envious. thank you for keeping us informed and up to date. Your pix are spectacular. love being a part of the journey. I have been working on my photography but nothing like your idea. where next? cant wait. be safe. Gooo to hear from you Rosalba. I’ll be in Texas for a while. Check back in to get the details. Last summer I drove with some friends from Jacksonville to San Antonio on the 10 and to be honest.. I slept right through the passing of the Mississippi river. I was so bummed! But your pictures bring back a lot of good memories for me, thank you for sharing! Thanks for reading Derek. I would have fallen asleep as well. Driving on interstates is not that interesting, especially as a passenger. Here you can view and buy many more of my photos .